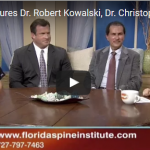 CBS News recently featured neurosurgeons Dr. Robert Kowalski and Dr. Christopher Koebbe along with the Director of Pain Management, Dr. Ashraf Hanna from the Florida Spine Institute. During the interview, they reviewed why it is crucial to choose a doctor and hospital that implements cutting edge technology and techniques. The Florida Spine Institute is top rated and their team is making a difference in people’s lives in the Tampa Bay area. “The majority of our patients do well with conservative care and only 5-10% of patients will have to undergo spine surgery. When it comes to spine surgery, our neurosurgeons offer all aspects of surgical procedures from minimally-invasive surgery to the more complex multi-level fusion surgery, instead of being limited to only one procedure like laser spine surgery. The Florida Spine Institute is proud to offer the latest advancements in treating spinal surgery along with treating spine and joint pain for over 25 years. They are the leading and most trusted medical facility in the Tampa Bay area. You can watch the full interview below.